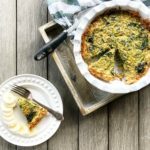 Whole30 Breakfast Quiche packed with veggies but easy to customize. Shred the potato and remove as much moisture as possible (I like to use a salad spinner). Toss with 1 tbsp of ghee. Press into pie pan. Par-bake for 15 minutes or till the edges begin to get crispy. Whip the eggs and nutpods (or compliant non-dairy milk) till smooth. Add sliced kale and diced onion. Season with salt + pepper. Carefully remove the crust from the oven. Pour egg mixture into the pie shell. Bake for anther 18 minutes.